Home» Daily Sprout » Monster Salmon not approved for sale in the US! Monster? 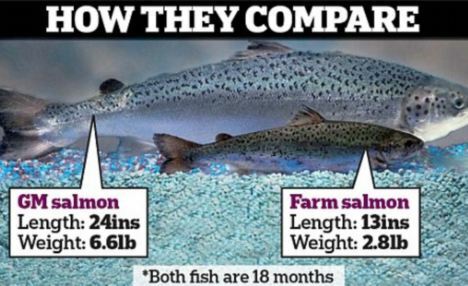 I don’t actually mean monster sized salmon, I am actually referring to “Monster-like” salmon, because the ones I am referring to are genetically modified. Not too much unlike Frankenstein if you ask me, which is what the Daily Mail Reporter called it. Our mission is to play a significant part in “The Blue Revolution” – bringing together biological sciences and molecular technology to enable an aquaculture industry capable of large-scale, efficient, and environmentally sustainable production of high quality seafood. Increased growth rates, enhanced resistance to disease, better food-conversion rates, manageable breeding cycles, and more efficient use of aquatic production systems are all important components of a sustainable aquaculture industry of the future. Sounds all fine and dandy when you read it that way, but I have to say, something does not sit well with me regarding the safety of a fish, with a DNA structure that was manipulated by man, that grows at two times the rate as the same fish that was manufactured by God. And if you are an evolutionist, would you not agree that it would take many years for your gut to adapt to the digestion of an animal that undergoes growth changes over many, many years. So if we radically enhance the growth rate of a fish without stepped alterations, how would we adapt to that animals different DNA? This is a difficult area, and to fully grasp how we might be responding to eating GMO (genetically modified organisms) foods, requires more discussion and background work than I can accomplish in a single sprout. But one important area to look at, is the risk of increased allergies due to consuming GMO’s. First off, nobody can argue that we have not had an exponential increase in food allergies in the last decade. With nut allergies becoming an emergency in many situations, gluten and dairy allergies are also ramping up at an unprecedented rate… it is obvious that something is going wrong with our culture. I would offer up that our toxic load is the first culprit, and that the second is the consumption of GMO foods. As you listen to the interview with Jeff Smith in this link (if you are sitting in my office, be sure to go online and look at this), you will hear the key to this problem. GMO foods have a genetic sequence that is designed to produce insecticide which then makes the plant itself immune to the damaging potential of an insecticide. The problem is that these genes transfer into the intestinal flora in your gut, and takes up residence in their genetic sequence. Thus creating the potential for your gut to become an insecticide production plant. Their is much more to the process than this, but their has been plenty of research showing how this happens. Take a look at the Mercola GMO Video Library and you will be amazed (just type in GMO in the search box at this link). Given the significance of what we have seen with GMO crops in our gut. I believe it is safe to say that we should not trust a GMO animal product at this time. So back to the story. The FDA finds that there is nothing to worry about, that they salmon are safe. However, Congress, under the guidance of Alaskan Republican Don Young, has chosen to ban the FDA from passing this fish as being safe for human consumption. The fish has a growth hormone gene that was added, as well as a gene to turn that growth hormone “on” throughout the year. Making it one growth hormone rich fish!